As a result of aging, child-bearing, heredity, or changes in weight, your abdomen may not be as flat and firm as you would prefer. Women who have had children, in particular, may develop excess skin and a widening of the abdominal muscles, and these features may not be responsive to diet or exercise. A tummy tuck from Albert Plastic Surgery will give your abdomen a toned and fit appearance with a single surgical session. Dr. Mark Albert, a specialize plastic surgeon serving the Manhattan and New York City area, conducts an array of variations on the tummy tuck procedure to remove unwanted fat and tissue and to tighten the abdominal muscles. The result is an attractively sculpted body contour. NYC plastic surgery patients choose Dr. Albert because of his expertise in aesthetic procedures and his commitment to their satisfaction. As a highly-trained surgeon, he has presented professionally about tummy tuck on numerous occasions and continues to train in the field’s latest techniques. As a top plastic surgeon in NYC, Dr. Albert pays special attention to aesthetic details during the surgery; his approach is to give patients a significantly tighter belly, incision scars that are as low as possible and well-hidden and that fade well over time. These details allow for great cosmetic results and a natural, attractive appearance. Patients consider tummy tuck surgery to address a variety of concerns. Some simply have an excess of skin that keeps them from having a flat belly. More commonly, however, lax abdominal muscles—typically from dramatic weight change or pregnancy—cause the belly to protrude. To achieve a slim, attractive physique, many tummy tuck patients receive liposuction during the surgery. Dr. Albert can treat the flanks, mid-abdomen, and mons-pubis to smooth the transitions to the belly. 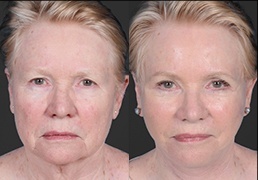 This gives the outcome of the surgery a more aesthetically appealing and natural look. During your initial consultation in his New York City plastic surgeon practice, Dr. Albert will talk with you about what you hope to accomplish with a tummy tuck surgery, and he will develop a plan that will best deliver those results. He will also outline his technique for incision placement and discuss techniques to minimize scarring, as these two factors may affect your long-term satisfaction with the procedure. Dr. Albert works diligently to hide scars during tummy tuck procedures, placing them low on the abdomen where they will rarely be seen. He usually recommends that patients use silicone sheeting or another form of scar management after surgery. These treatments, paired with his care in removing the right amount of tissue during the tummy tuck, help create a clean and unobtrusive scar. Dr. Albert’s approach to the procedure will vary based on the patient’s goals. He most frequently recommends a full tummy tuck as it can provide the most significant aesthetic improvement for the widest range of patients. For Manhattan and New York City tummy tuck patients with minimal excess tissue, he may instead suggest a mini-abdominoplasty, which usually does not involve surgery above the belly button. Place incisions where scars will be unnoticeable. Focus on giving your results a natural and symmetrical appearance. Conduct liposuction if necessary. This will eliminate fat and create a smooth transition to the abdomen. If you are having a full tummy tuck, Dr. Albert will use expert plastic surgeon techniques to fold and rejoin the abdominal muscles that have separated. This will give your abdomen the tightest contour possible. During your surgery, Dr. Albert may also administer a long-lasting, non-opioid medication such as EXPAREL®. By applying the medication to the underlying layer of the abdomen, he can significantly improve your comfort during the healing process. It is important to walk shortly after your tummy tuck surgery. You may feel a bit hunched at the beginning, but the tightness will ease the more mobile you are following the procedure. You should also sit in a lounge or “beach chair” position for a day or two when not walking. Most patients can participate in regular activities and light exercise three weeks after their tummy tuck and return to more active exercises after about six weeks. Dr. Albert will typically place drains during surgery to prevent fluid accumulation. When buildup has reduced, you will return for a follow-up exam, during which Dr. Albert will remove the drains and make sure you are progressing well in your recovery. He will also review your scar maintenance plans and advise you as necessary. If you wish to not have drains, Dr. Albert is able and willing to do a tummy tuck without drains. Once you have fully healed, you can expect to have a firmer abdomen and flatter belly. Typically, results are long-lasting as long as you don’t experience significant weight changes. With careful placement of incisions and by following scar healing protocols, signs of surgery should be unnoticeable and well hidden. Tighten your torso and eliminate excess skin from your abdomen with tummy tuck. Patiends from the NYC metro area from Westchester to Manhattan to Brooklyn should contact Dr. Albert online or by phone at (212) 203-8623.